Having moved on from a travel system I needed something lighter to use for my toddler we were recommended this. With its extra large hood and massive seat it's worth the investment as it has lots of growing space. The basket could be a touch bigger, but hey, everything else is great so I won't dwell on the negative. With its solid bar handle it means it's so easy to push, even with one hand! I shall definitely be keeping this as ours forever buggy from now as it's brilliant for the many adventures we go on as a family. Very sturdy, easy to use, huge seat so your child has plenty of room to move about. Overall it is a brilliant pushchair for being out and about in. Loads of room for the little one, extendable good, easy to move about. Such a solid pushchair and I would deffinately recommend to anyone. This is the perfect quick easy pushchair to use easy fold up and put up great for travelling comfy stylish . Easy to use, light to push, big seat and excellent hood. I love this pushchair, it’s easy to push, sturdy to go off road. Easy to fold. It has a large shopping basket. The hood is fantastic with how low down it goes. It’s built to last I got this for my first child when he was 1 yrs old it’s now about to be used for my 3rd child the only wear is a rip in the rubber of the handle. I absolutely love this pushchair. I’ve just had my third baby and even after about 5 years from not needing a pushchair I will certainly buy this again. I went through so many pushchairs until I found this one and wished I had bought it first. Childminding I could push one handed and have another child walk by me. Child was always comfortable. Sturdy. Easy to put up and down. Great size hood! This is by far the best all rounder I have had. And with 3 children we have been through many pushchairs. Folds flat for the boot, easy to put up and easy to manoeuvre with one hand. Highly recommend and I will be getting one if these again! Easy to fold and manoeuvre. Suitable from birth. Not bad off road. Have to buy accessories separately. We love our buggy, bought for our new born. He sleeps well in it and it's so easy to fold. It fits in our Peugeot 107 boot. Np need for a carry cot and lots of friends have admired it. It is a shame, though that things like the rain cover have to be bought separately. i had this buggy for my oldest daughter and middle. Ewan had a double at one point. these buggys are great and easy to.move around and fold with one hand. the hood covers are big so they can go right over baby. can even attach a carrycot onto them which was brilliant. The best pushchair what I have!! Easy to use. Very light. Small size but very comfortable for a kid 🧒 I’m sure if I will be need again any pushchair I definitely buy again this one. Good prize for good stuff. I recommend to everybody this pushchair. I totally love this buggy. This is truly one hand fold. Ideal to travel. Very easy to push even one handed. All covers are easy to wash, even with a damp cloth. The stain are coming off very easy. When I was pregnant with my first, the City Mini Baby Jogger was recommended to me as a light weight, easy to use, versatile buggy. Initially I was a little out off by the price, but when I tried it out in the shop I was sold. It was so easy to put up and down! Having not much storage in my house, I can easily store this anywhere without getting in the way. You can use it with adaptors for younger babies (the carrycot deluxe which is worth the extra spend and a maxi cost car seat). The hood is fabulous and it is easy to adapt to different ages. There is plenty of space underneath for storage when out. The adjustable handle height is useful for comfort and the break at the side is easy to use. The GT has 1 wheel at the front which makes it great for navigating a variety of terrains. Overall a great buy! Planning on getting the double for my next! I prefer 2 handle bars. I absolutely love this push chair. I had another one I purchased second hand to begin with, and I used to dread taking it out because it was so hard to collapse! This one you have NO problems like that. It looks smart, it’s easy to clean, it folds up so easily and in seconds. It’s also really flat when collapsed so can be stored in small places. Even when I was heavily pregnant with my second, I didn’t struggle with it collapsing and lifting it into the boot! We took to Ibiza also, very sturdy, easy steering. Great all around push chair. I recommend to everyone. My only negative is that I prefer 2 handles instead of one, but other than that it’s great. I bought this buggy for my daughter when she was only a few months old. You can buy additional accessories for it to make it more secure for the little ones and can last all the way up till they no longer need a buggy. It is super easy to steer also, you can do this one handed and even when the child is older it is still very easy. The suspension in it is fantastic also! Folding for the buggy is very very simple and can be done and lifted with one hand and when folded it is very compact and doesn’t take up a lot of room. It is light weight but sturdy and I loved being out and about with it. Overall a fantastic buggy and would recommend to anyone! 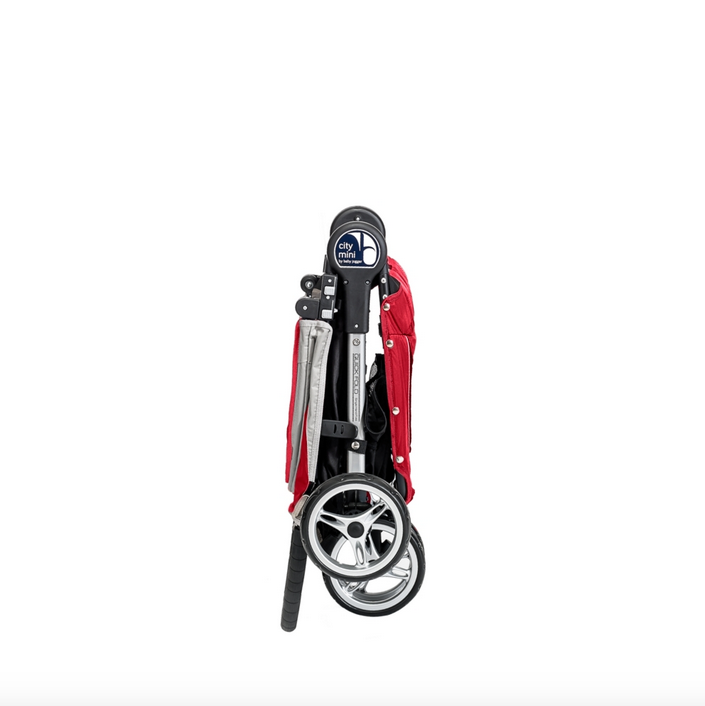 Very happy with this product I like the fact that it is light weight and easy to fold up. I live in a 1st floor flat and it's a lot easier to carry up and down stairs. 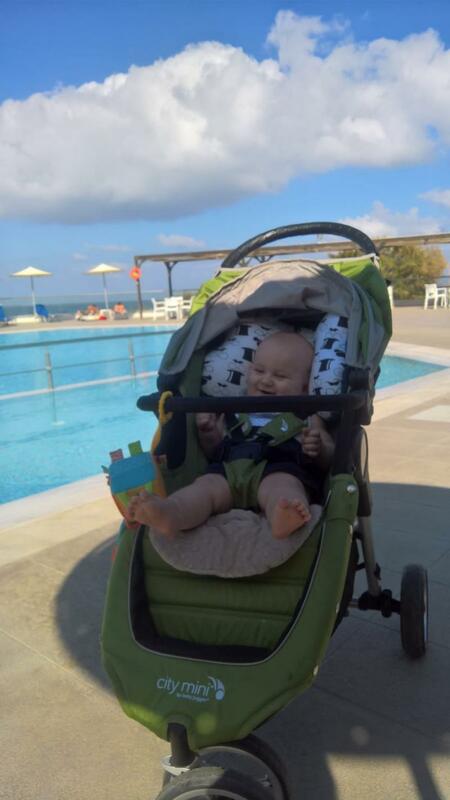 We purchased this pushchair as a spare to our large travel system. I am not keen on the umbrella style fold so wanted a pushchair that folded over. This folds down easy enough while holding a screaming toddler! We have tested it on many different terrains and it faired really well as we taken it camping! With the seat being large it will last longer compared to other pushchairs, it also helps said screaming toddler to magically sleep! So it is amazing! This product is stable and very sturdy the only issue I had was folding it I struggled with doing this quickly If I was getting on or off the bus. But I would recommend this pram to anyone who lives near bumpy roads. We had this pram for going abroad and we are now going to buy our own one. It is perfect t for any occasion! Easy one handle to collapse and you just lift the handle to put up. The uv cover is also great for completely covering the baby. I loved this pram I went through the icandy and ,mcclarene pushchair and found the perfect one with this extending hood amazing in rain and sun to protect child. 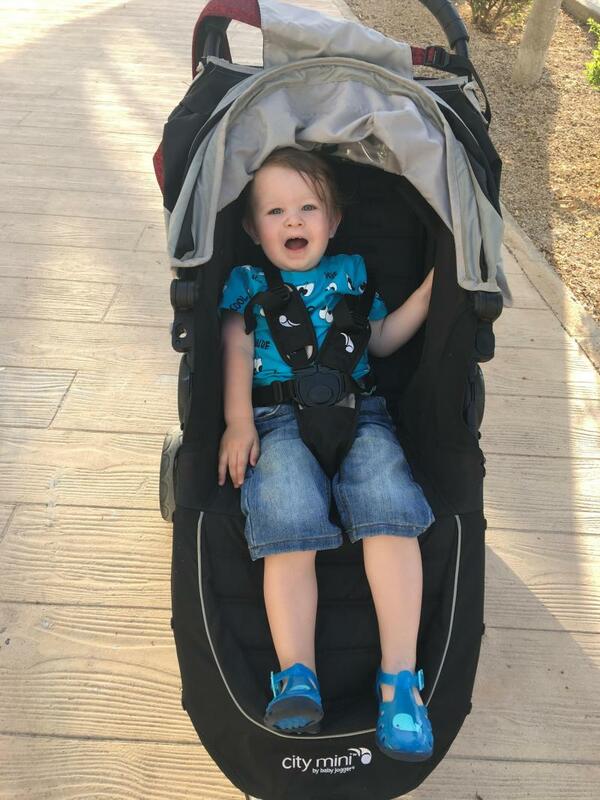 Very spacious I used until my son was 4 still had room good for both city and country walks sturdy easy to fold looks great and kids always seemed comfy definitely my best pram to date I am pregnant again and will be purchasing one for the new addition. I bought this stroller as it was suitable from birth. I have a travel system but we use this in my partners car for when he takes the baby out. 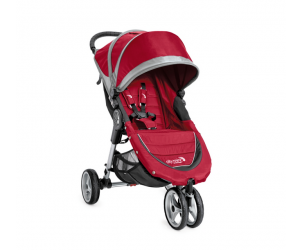 It’s a great lightweight stroller and the one hand folding makes it quick and easy to pack away. The seat area is very large so will definitely fit my baby until she is at least 4 I would think! 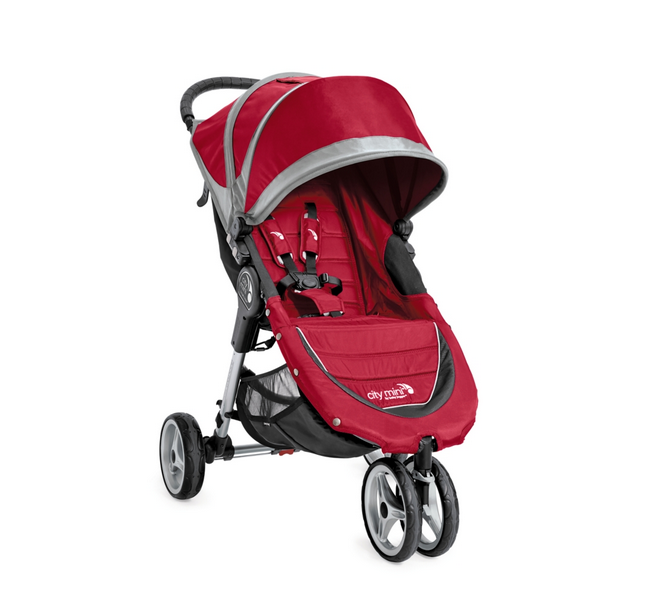 The Baby Jogger City Mini means it has never been easier to get around with your child. This stroller has been created with the urban jungle in mind, being lightweight, compact and practical. It can even be folded using one hand. The city mini is not intended for jogging. Suitable from birth to approximately 3 years, the seat can be laid to near flat to accommodate even the smallest of babies. The side vents and a fully retractable weather cover will ensure your child's comfort and safety. The city mini also offers all-terrain wheels that are suited to both city-scape and countryside - front wheel suspension helps give you full control on where and how you go. 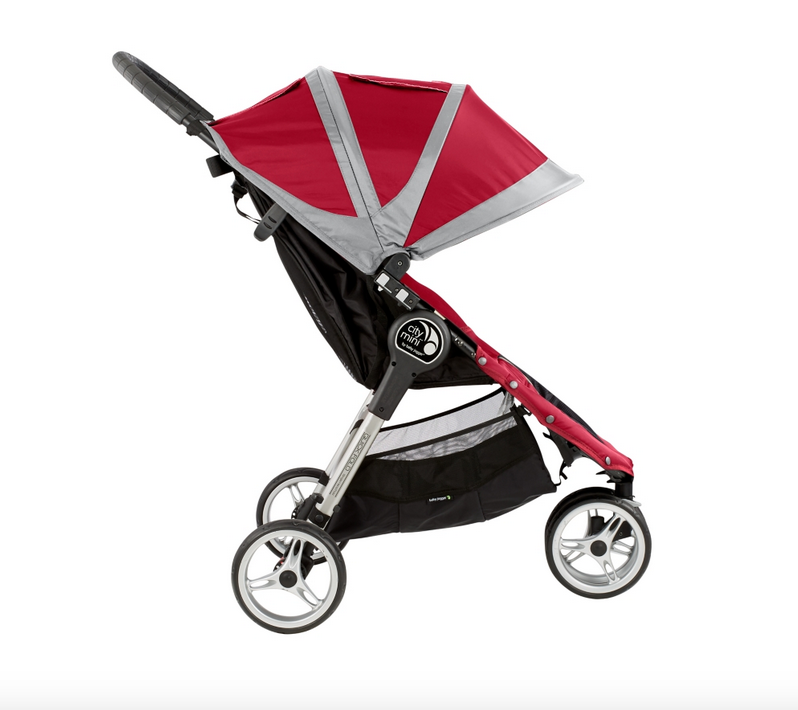 Even on the hottest days your baby is protected by the hood canopy with SPF 50+ protection, and two built in peek-a-boo windows allow you to keep an eye on baby watching the world go by.